Who would have thought that arranging days out would have been so difficult. Well we finally got there. I have arranged a day off but we are going to do the Brighton challenge that day as it was difficult to reach Brighton by train this weekend. We decided to take the catamaran to the Isle of Wight. It is just across the water from where we live (quite an expensive piece of water too!) and somewhere which holds many childhood memories for me. We have also taken the children for many days out and a holiday there too. When you are on the ferry, it really does feel like you are going abroad. I had only been on the catamaran with the children once before though and that was a day to Ryde with friends. I could remember clearly Kathryn as a toddler not liking the hot sand on her feet at all. She was a lot different on our holiday in Lanzarote! I said that it is an expensive piece of water but thanks to Tesco Clubcard vouchers, it was a cheap journey. We were very ambitious on the time and decided to go for a 9.15 am ferry which meant getting up very early on a Sunday morning. It worked out well though and the catamaran was quiet. My memories of our previous trip on the Isle of Wight was that it had been quite crowded. Mind you we had buggies, changing bags, buckets, spades, fishing nets etc. 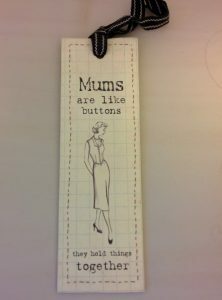 It certainly is a lot easier with two grown ups! We were in the Isle of Wight in just over 20 minutes. We decided we would take the train to Shanklin and visit Shanklin Chine. It looked as if it would be quite a pretty walk. The trains that are used are old underground stock and are quite bumpy but got us to Shanklin quickly. We found a map and managed to successfully walk to the Chine. 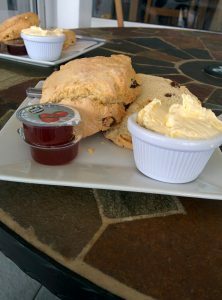 On the way we looked at all the places we could have a cream tea and found the most amazing place to have ice cream. We had brought chicken sandwiches but planned to have an early cream tea and an ice-cream. So healthy!! 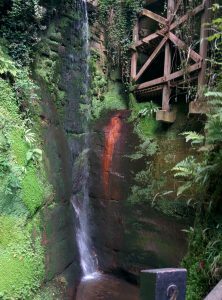 Shanklin Chine is the Island’s oldest tourist attraction which was carved by Mother’s Nature’s own hands over thousands of years. First stop was the cafe for a cup of tea for me and a mango fruit juice for Kathryn. That girl is so healthy now she didn’t even touch my biscuit! We were now ready for exploring. The scenery is beautiful and I loved the waterfall. Kathryn was impressed with PLUTO, the pipe line under the Ocean, which was created and used during the war. She was able to fill me in on the history. 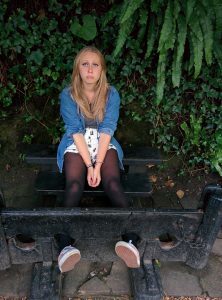 We were able to put Kathryn in the stocks (one of my favourite memories is of a picture taken of me in stocks at Blackgang Chine on a surprise trip with my Granddad) and even managed to work out how to use a telescope. The rescue birds are lovely to look at and we spent a bit of time enjoying them. 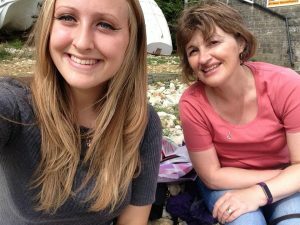 We ate our sandwiches on the pebbled beach and then hunted out a cream tea. We decided on the Waterfront Bar which looked beautiful. They also had live music, a singer called Ben Barnes. We did enjoy listening to him whilst eating our cream tea. We were a bit greedy and ordered three scones but only managed to eat one each (we had a doggy bag for the remaining scone). We were so full that we had to miss the ice-cream. Such a shame as it had looked amazing. We would like to think that we walked our scone off by walking along the coast to Sandown. Well we can dream! The walk was lovely and we did eventually find the railway station. We didn’t know the timetables for the trains but luck was on our side and we arrived just as the train turned up. Another bumpy journey took us back to Ryde where we had a drink before catching the catamaran back to the mainland. It wasn’t the hottest day that we have had this summer but it was warm. 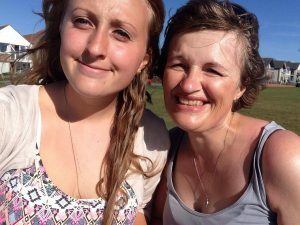 I had a lovely day spent with my daughter and hopefully, one we can repeat, to explore some more of the Island. Since I accepted my 50 challenges, my reading has been a lot slower than normal. That said, I am enjoying taking on the challenges and finding so much I enjoy. I will update in a few days on how I am doing. Read your daughter’s 10 favourite books …. in paperback! 1. The cover – I have an older kindle so I don’t get to see the cover. I haven’t got used to reading from my phone yet but when I do go in to the kindle app, I can see the book covers. I know you shouldn’t judge the book by the cover but a pretty book cover is great. 2. Chapter layout – I did find it easier to see when the chapter was going to end. 3. Page numbers – I do like to know how many pages I have got to read. Sometimes the books on kindle have the page numbers but when they don’t, it is done in percentages. I happen to like percentages though so not too negative for the kindle. 4. Bookmark (this is a double entry though as it will appear in the bad list too) – See the pretty bookmark I received from Kathryn. Makes reading the book worthwhile. 5. Sharing books – You can easily pass on a book to a friend to read. There is a facility to share on kindle but not so easy. 1. The size – Proper books are not so good for carrying in your bag. My kindle fits in most of my bags and is light. I am also carrying hundreds of books too. 2. Ease of reading – Reading in bed in the morning whilst trying to drink a cup of tea is very hard with a paperback! 4. Bookmark – Kathryn would not allow me to turn over the corner of a page in a book so a bookmark was needed or you lose the last page you read. The kindle, (if working correctly!) once turned on opens at the last page read. 5. Waiting for the book – I know that this can be a positive thing too but as long as I have internet connection, I can download a book in a few seconds which is so much quicker than buying a physical book. Okay, so not so good for the bank balance!! I am enjoying the novelty of reading a “proper” book though and looking forward to reading Kathryn’s 10 favourite books. As previously mentioned, I choose Giovanna Fletcher’s Dream A Little Dream for my first read of August. Giovanna is the wife of Tom Fletcher – member of McFly, mother of two and a talented writer. I have enjoyed previous books by the author. My favourite book is Billy and Me. Dream A Little Dream is about Sarah who is single (having to endure a closer than normal relationship with her ex to keep her friends happy) and in a job that she is not entirely fulfilling but she is kind of happy! Sarah starts having dreams about a mutual acquaintance from her student days. What does she do when dreams turn into reality? Although I can’t say this was my favourite book by the author, I did enjoy reading it. I loved the concept of the dreams because I do believe that are dreams have a message. There is a toilet incident in one of the dreams which I know I have a similar dream to. I don’t know what that message is though- must be an insecurity! I did like the way certain topics were dealt with and how the sensitivity around the subjects were handled. The book was able to make me laugh and cry in all the right places. Wasn’t so keen on the bad language as I did find it a bit unnecessary but I did also think that even that was explained too by Sarah herself. The reference to Mark Owen from Take That in the book was brilliant – something most of us felt! The ending of the book was just as I wanted and I will probably borrow Kathryn’s Dream a Little Christmas Dream in December to catch up with Sarah. My second read was also one of my challenges – to read a different genre I wouldn’t normally read. Jordan was choosing a book for me this month and I did think that I would get a book about the war to read or his childhood favourite, Biggles. 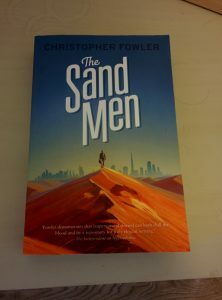 He actually chose one that he was reading – The Sand Men by Christopher Fowler – a thriller writer. I bought the book for the kindle then read the description. 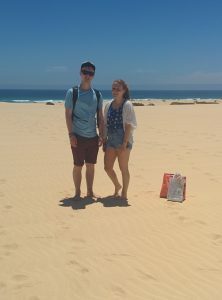 Lea, Roy and their daughter had moved to a gated community reserved for foreign workers in Dubai where Roy has been hired to deal with teething problems at Dream World, a futuristic beach complex. The description seemed to be something I would enjoy and I was looking forward to reading about Dubai. I did get into the book quickly and whilst it appears that everyone is happy, it does seem that there is something that is being hidden. I did find that for the last half of the book, it jumped a lot. I was convinced that my kindle hadn’t downloaded the book properly but Jordan confirmed that his paperback was the same. I didn’t actually enjoy the ending as I had found it unbelievable and perhaps rushed. Jordan finished the book whilst I was reading it and did think the same as me. Perhaps thrillers aren’t my thing. I will choose my own book this month. I always download the classics but never read them so I will choose one of them. 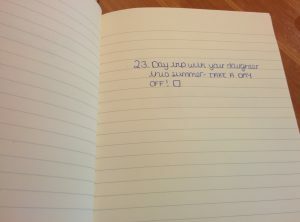 With the summer days getting shorter and Kathryn’s very long student’s holiday coming to the end, we were running out of time to get this challenge completed. We originally set aside last Sunday but weather forecasts did not look good. We rescheduled for this weekend and decided on the Friday. At least if the day hadn’t been good, we had three more days to choose as it was a long bank holiday weekend. I kept an eye on the forecast and was very hopeful. The weather has certainly been beautiful all week on the south coast and the weather forecast was showing a big yellow blob for Friday. I now had to think about the food I was going to take. Kathryn is now a very health conscious eater so I wanted to incorporate some of this in too. I did have a desire to make some sausage rolls though which I know weren’t that healthy but would be an achievement for me to make. Updating my shopping order on Thursday evening meant I had to abandon that idea as there wasn’t any sausage meat but went for healthy mustard and honey sausages instead, one of our favourites. In the end, I went with quite a 70’s theme and put everything onto cocktail sticks. Friday morning was spent in the kitchen cooking sausages and balsamic chicken strips (Rosemary Conley recipe so healthy). I also put together my childhood favourite, cheese and pineapple. Does that count as being healthy because it has fruit and I used low fat cheese – I can hope! Whilst putting in my shopping order, I found a recipe for Jaffa Cakes by Mary Berry from the latest Great British Bake Off episode (must catch up with that). 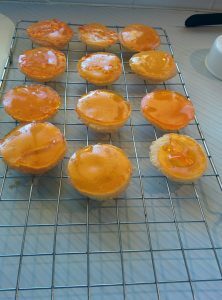 I thought they looked quite fun to do so thought they would be perfect for our picnic. I have to say that the recipe lied – it said the only tricky part was getting the chocolate to look perfect – I had trouble getting the jelly to dissolve. As a child, my mum often made us jelly and she didn’t have this problem. 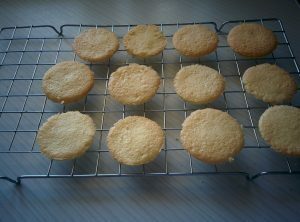 Anyway 10 minutes later, I finally put it in the tin for it to set and made the base of the cakes. They were quick and easy to make and putting them together was quite fun and a bit messy but the result was good. 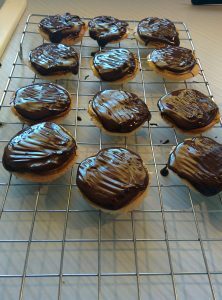 I had made jaffa cakes! 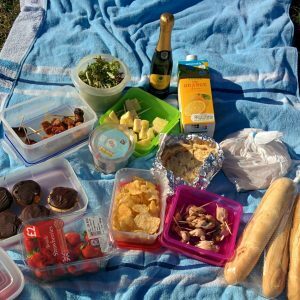 I packed up the picnic and walked to the beach to meet Kathryn for our picnic. She added some beautiful ham and juicy sweet strawberries to the haul. 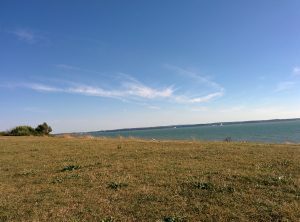 It was the perfect weather and we found the perfect spot looking over to the Isle of Wight to enjoy the food. 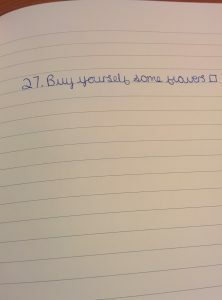 A very good challenge to tick off. Well this is quite a challenge. Why? It is because I am well known for starting a cross stitch project and not finishing it. 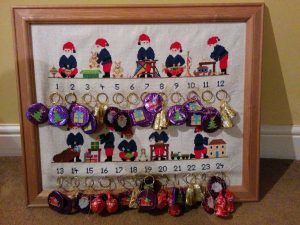 I started cross stitch in my 20s when Chris bought me a small kit for a stocking filler. He had to show me what to do as it did look double dutch to me but I soon got the hang of it. 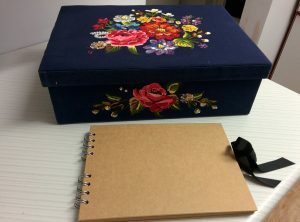 I was soon investing in bigger projects and every cross stitch magazine going. 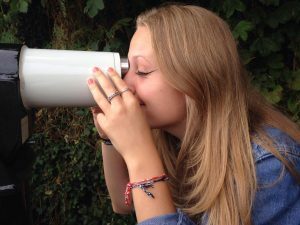 I joined round robins and found quite a community of people taking part. If this wasn’t enough, Chris set us up with a cross stitch website selling cross stitch kits from home. That was quite fun for a while too. When I went back to working again we closed the website down. I was now 40 and all of sudden I needed glasses for close work. I was also addicted to the internet so cross stitch was hard to fit in. I have tried to get a project in every now and then but never managed to finish so I am determined that I will complete this. 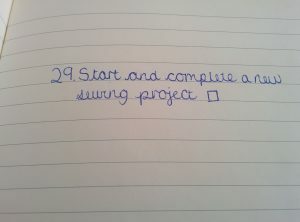 Now just choosing a project has been so difficult. I have spent 3 evenings over the last two months going through Sew and So’s site and have had so many different sorts in my shopping cart. Should I stitch for someone else? I did have threads so was I being a coward looking at a cross stitch kit. How about Christmas stitching which is my favourite; look a completed design and one that comes out many years (word is children will not share this with any children they may have!). Thinking of Christmas, I started looking at Heritage, DMC and anchor designs. How about Country Companion or Tatty Ted? I have a few uncompleted Country Companions and I don’t know why as they are fantastic but have actually finished this lovely Tatty Ted. Determined I was going to make my purchase on Friday before 1pm so I could have it delivered Saturday, I found my latest Sew and So brochure with a code for free needles, and a Bothy Threads kit from their Sew Dinky range caught my eye. 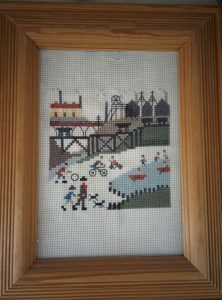 I had stitched a Lowry kit from their range many years ago so thought I would have a look. I found a Christmas kit in the range so put it in my trolley. Still not satisfied I searched for another hour. Time was ticking by but I was still determined I was going to make the purchase by 1pm. Finally after reading reviews and falling in love with Gorjuss range in the Bothy Threads collection, I thought I would actually stitch something for myself. Another big choice as there were so many designs but I wanted to fit it in with something I liked too. 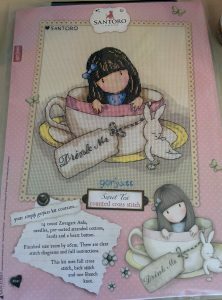 In the end I chose Sweet Tea cross stitch kit. Order in and delivered Saturday. 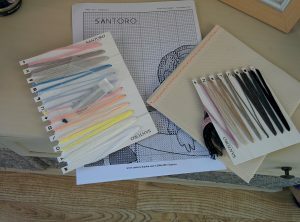 Cross stitch is like choosing a book and the excitement of opening the package, sorting the threads (some dedicated stitchers will say sorting through the threads for the different colours is fun but not me) and starting it is exactly the same as starting a new book for me. I am pleased to say that the kit came with the material, needles, two thread cards with all numbered threads attached (hooray for me), large charts (I can see them), one for the cross stitch and one for the back stitching plus some beading and one french knot and also a sheet explaining where to start and the strands needed for the cross stitch and back stitch. 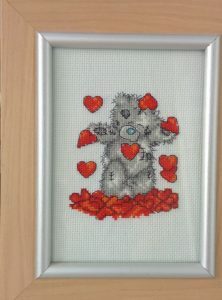 They have given lots of advice so any beginner could stitch this kit. After reading it, I hope I don’t have too many problems. I have even joined Bothy Thread’s facebook group so I can hopefully get tips and encouragement. I plan to put the first stitch in tonight whilst watching Andy Murray win a gold medal! Will keep you posted with updates of how the project is coming along. I have mentioned before that I love my iPod and on it is stored lots of different music. Included is music from West End Shows which I love. As a child, I was lucky to go to some great shows at the local Kings Theatre in Southsea as our teacher was the Conductor with the Portsmouth Players. I first went to a West End show on 18th October 1991 to see what will probably be my favourite show, Miss Saigon. I remember seeing it being performed on the Terry Wogan show in 1989 and knew that I had to see it. It was a Friday night and going to see the show in Drury Lane was just magical. It was an experience that will stay with me forever. 25 years after this and I have seen many musicals. I say Miss Saigon is my favourite but each time I go to see a show, I love them all for different reasons. The theatre experience is not the cheapest of night’s out but such an enjoyable one for me. Even before I hit 50, my daughter insisted my birthday should start early and treated me to see Guys and Dolls. We both went in not knowing what the musical was about and were treated to a brilliant show with some wonderful talent. Hearing Richard Fleeshman sing just brought tears to our eyes – what a voice. This is certainly one of the reasons why I love going to the theatre, and whether it is professionals or amateurs, I can’t help get goosebumps when I hear amazing voices. I am lucky to live close to many theatres so do have quite a good choice of shows. One of the theatres is Chichester Festival Theatre in one of our favourite cities which we love to shop in. The theatre does have a lot of new musicals appearing in the Summer season and I have always said “I wish I had seen that show”. 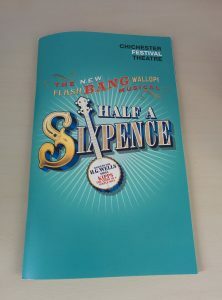 When I saw that Half A Sixpence was going to be there for the summer season, I was determined to go. I remembered watching the film many times as a child and loving Tommy Steele’s big grin in it. Tickets purchased, we made our way to Chichester and I thought it would be a good idea to achieve challenge 37 – buy a new lipstick. 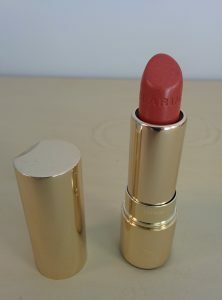 I decided that I would treat myself to a special one and as I haven’t got a clue when it comes to make up, I headed to the Clarin’s counter at House of Fraser and ask for assistance. A lovely lady called Alicia tried three lipsticks on me. She got the sale before even trying them on as she told me my lips were beautiful! I liked all three but decided to go for the in between one called Rosewood. Not too bold but would be fine for day time to night time. 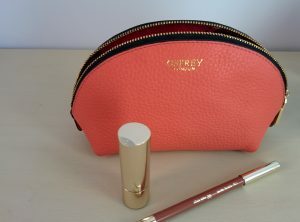 It was a bit of an expensive purchase for someone who doesn’t spend on make up but it was worth it. After a downpour of rain which meant we stayed in House of Fraser for lunch, we made our way to the theatre in sunshine. The grounds of the theatre are lovely and I did refuse a glass of champagne from the Nyetimber bus. Reason being I would have probably fallen asleep whilst watching the show. Well there wasn’t any chance of me doing that. I do get so engrossed in musicals. I did love the singing and the familiar songs but I couldn’t keep my eyes of the lead, Charlie Stemp. His dancing was fantastic. I did love the Money to Burn song with the banjo music. The finale was the familiar Flash, Bang, Wallop which is such a joyful end to the show. I certainly came away loving the show. Well Flash, Bang Wallop brings me on to another completed challenge. 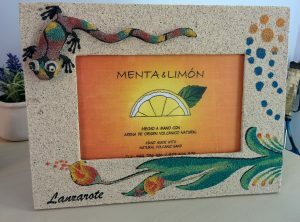 I had to buy a Lanzarote frame when in Lanzarote. That was the easy part. 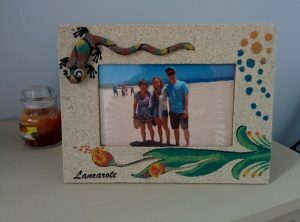 I then had to print a picture of myself with my son and daughter taken whilst we were in Lanzarote. 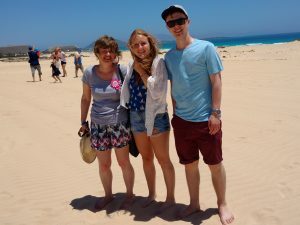 Whilst we took lots of pictures, the only photos we had together were when we took the day trip on my 50th to Fuerteventura. Hopefully I will be allowed this one. Now printing it wasn’t as easy as I thought. It needed cropping and after a few failed attempts, Chris took pity on me and almost fitting some of the lyrics in Flash, Bang, Wallop, it was “stuck in the fam’ly album” – well frame! So there are two more challenges completed. Must get on with a few more now. An easy challenge. I didn’t actually go out to buy myself any flowers but noticed these at our local store. As I remember them growing in my Grandparent’s garden I thought they would be lovely to have in the house. They looked beautiful in the house for a couple of weeks. 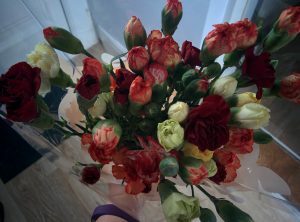 I realised though that I am lucky and I do often have flowers bought for me. Just as the Sweet Williams were coming to the end of their life, Kathryn bought me some beautiful roses as a present to remember my Mum. Mum would have preferred the munchies! 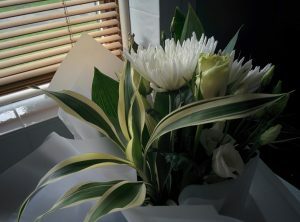 A week later, I was pleasantly surprised to come home from work to find some flowers had been delivered to me. 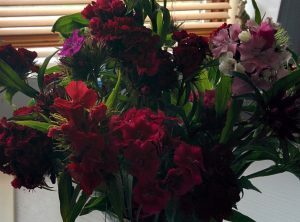 They were a lovely present from my brother, Richard, his partner, Graham and Graham’s parents to celebrate my 50th birthday. It honestly feels like a birthday never coming to an end! 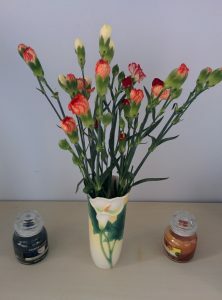 Last weekend, the house was a bit bare without any flowers so I thought I would make this challenge a regular one. This bunch of carnations found their way into my basket. 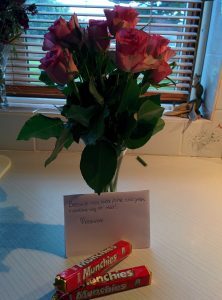 There is nothing nicer than giving though and as there were plenty of flowers, I shared them with Kathryn. As previously mentioned in my About Page, I started running three years ago. I started slowly by following the couch25k programme. 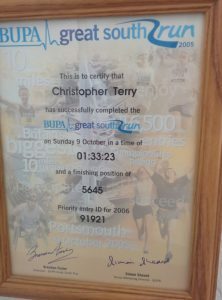 I must admit that whilst I built myself up to run for 30 minutes, I rarely achieved the 5k. After running a lot in May, I have pushed myself to go further which is a good thing as there are a few running challenges to complete. 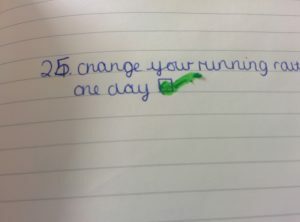 Today I managed a tick on Challenge 25 – Change your running route one day. Not very adventurous, I normally run round the block a few times. I change the direction and that is when I am being daring. I also keep to quite a flat surface and do not cross busy roads. After joining the Strava community, I try to sign up for a monthly challenge and this month was completing 10k. I thought I would combine this with changing the route. So first thing I had to do was to turn right instead of left, cross the road at the traffic lights and head towards the sea. It was very pleasant and I was soon at what I thought was half way. Quick look at my phone and I had only run 1.8 miles. 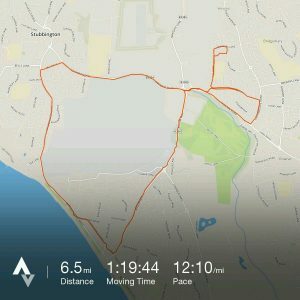 Knowing I wanted to achieve 6.2 miles I thought rather than go back the same way, I would change my route again to make it longer. I found out the reason I stick to the same route. If I ever got tired, I was not far away from home. 2 miles from home feeling I could not run any further did not seem fun to me. I realised that this was psychological and I had to overcome it. One of the things that helps me with my running is my music. I always start with a walk to George Micheal’s version of Feeling Good. Then I go onto my running play list which has a mixture of songs that I love. I was really needing something to keep me running when Tony Christie’s Is this the Way to Amarillo came on. Just the inspiration I needed. One of my Mum’s favourites so I felt she was spurring me on. On the home straight, I was further inspired by Kelly Clarkson’s Stronger, Aston Merryfield’s Get Stupid and the one that kept me going to the end was Keep on Running by The Spencer Davis Group. I was overjoyed at managing to actually clock up 6.5 miles and overcome some fears along the way. 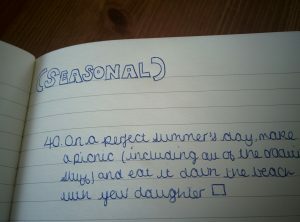 Not forgetting the most important – another challenge ticked off. I have set myself further goals now – I will change my route once a week. Now just trying to find the courage to sign up for the Great South Run. Actually running it will mean another tick. Both my Husband, Chris and Daughter, Kathryn have run it. They are both competitive – I would be happy to do it in 2 hours. I wouldn’t run now if I hadn’t starting running with the couch25k so would highly recommend it to anyone starting. If I had started trying to run without this programme, I would have given up. Now I must keep on running. 1 You can complete the the tasks in any order. 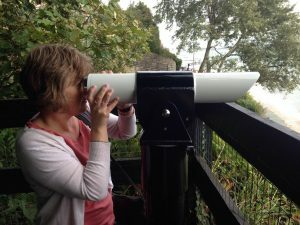 Now I am 50 I thought I would start a blog. Lots to come. Please visit my about page to find out about me.